A new student organization called the Fight for Just Food unfurled two large banners Monday night in Bartlett Dining Commons calling for an end to the University’s dining contract with Aramark. 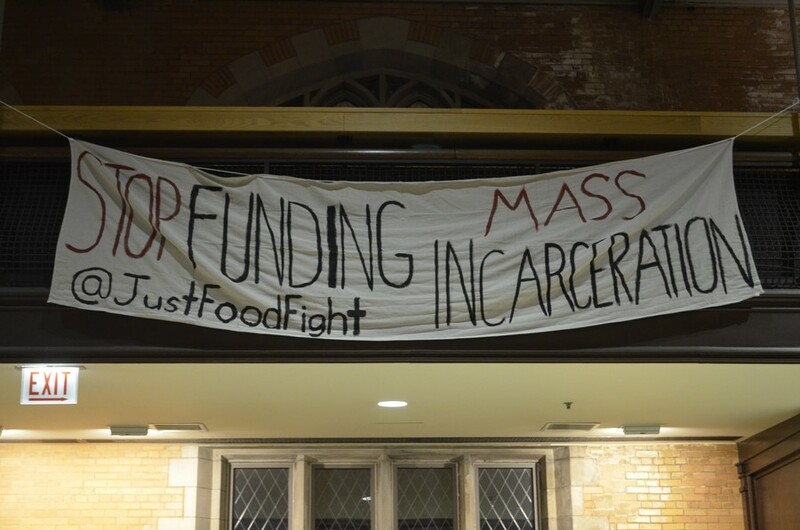 The Fight for Just Food wants the University to cut ties with the multi-billion dollar corporation because of its contracts with prisons across the United States and use an in-house, “self-operating” food service instead. Aramark’s contract to provide food and facilities services, including custodial and maintenance work to the University of Chicago, is set to expire in June. The group’s moveon.org petition also highlights underfeeding of prisoners and contraband smuggling by Aramark employees. In the past, Aramark has been the target of several lawsuits, including by the American Civil Liberties Union. Aramark has come under fire from UChicago students in the past year over faulty and incomplete allergen and nutrition labeling. The Fight for Just Food’s petition calls for the University to end its contract and proposes a self-operated dining service as an alternative. It also demands that the school guarantee the continued employment of current dining hall workers and allow for transparency and student input throughout the process. The group’s call for the University to abandon Aramark coincides with a broader movement among schools that is increasingly opting to end their contracts in favor of self-operated dining services, including Yale, Harvard, Stanford, and others, many of them for similar ethical reasons. The University will announce its decision early spring quarter, according to the UChicago Dining page. Until then, the Fight for Just Food will continue its activism, holding weekly meetings and educational events, and a potential town hall meeting with members of the school administration.